Non-fiction kids' books have never been hotter. The ideas, the colour, the format, the illustrations and the superbly-researched and out-of-the-box ideas are just stunning, and In Focus in so exception. Published by the team at striking new imprint 360 Degrees, In Focus takes a closer look (literally!) at the inner workings of everything from igloos to whales. Divided into 'chapters' (really double-page spreads with page flaps that each open to make a four-page spread), topics include ocean, homes, earth and space, landmarks, nature, everyday objects, buildings, fruit and veg, animals and transport. Information and striking illustrations are splashed across each spread, with a note on who has illustrated each one (thank you, 360 Degrees!). Children can then open this entire spread to showcase the inner workings of the items or creatures already shown on the initial spread--offering either close-ups, cross sections or cutaways, to give us a totally new perspective--and will often make the eyes (and brain) boggle. Children will fall into this book. Stricken with that particular brand of kid curiousity, they'll find this content utterly mesmerising. The skeleton of a seahorse, a cross section of a yurt, the inner tubings of the Space Shuttle, and the construct of the pyramids--there's so much to discover and wonder over, with just enough text to incite hunger for further information. 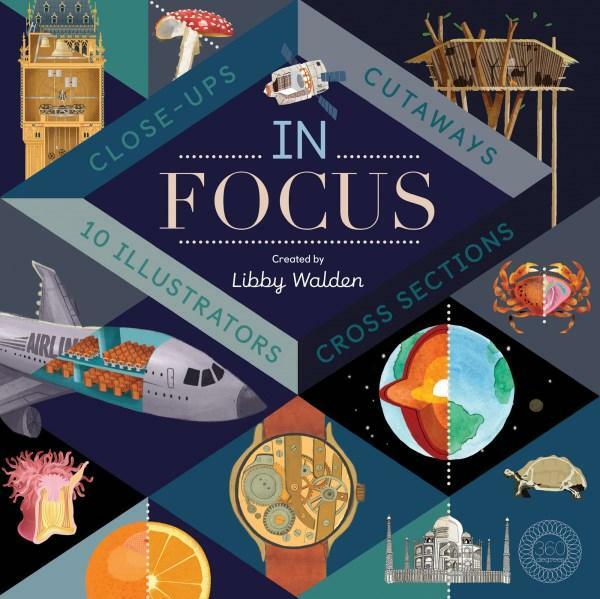 Thick, uncoated paper brings both durability and a modern edge to this detailed book, and highlights the fabulous range and variety of illustrations by 10+ independent creators. Beautifully crafted and brilliantly conceived--this is picture book making at its best.